Planning a trip into the backcountry? Careful planning and consideration is required to ensure your safety while traveling Glacier Bay’s immense wilderness. Remember, safety is your responsibly! The Visitor Information Station (VIS) serves as Glacier Bay's permit office and information center for backcountry users. Attend an orientation and obtain your permit here. If you have questions about your trip, Rangers can guide you and provide local knowledge for the areas you will be exploring. If you would like to speak with a Ranger before your trip, please give us a call at (907) 697-2627 or e-mail us glba_vis@nps.gov. Register for permits at the Visitor Information Station. Camping permits are required for overnight groups in the backcountry and for the Bartlett Cove Campground. Permits are free of charge and do not require reservations. At this time, reservations for the campground are not accepted. See Alsek River or Mountaineering in the Fairweather Range for permitting in those areas. All backcountry users are required to attend an annual orientation with a Ranger before obtaining a permit. These orientations cover Leave No Trace, park regulations, and important safety information. Rangers are available to share their experience and local knowledge with you. Orientations are given during scheduled times at 10:00 am, 3:00 pm, and 6:00 pm. No need to sign up, just show up! If you need an orientation outside of these scheduled times (with a compelling reason) please contact the VIS. We are aware the 2019 sechedule for the Alaska Airlines Jet has an arrival time in Gustavus of 5:35 pm. We will accomindate to the best of our ability folks who will be arriving via the Jet, please come straight away to the Visitor Informatoin Station -- do not delay in town. Wildlife, negative bear encounters, or other safety concerns will occasionally cause advisories to be issued or areas to be temporarily closed for overnight camping. There are a number of islands that are closed year round. See a guide to park waters for closed critical wildlife areas. Johns Hopkins Inlet is closed seasonally to all vessels (including kayaks) May 1st to June 30th. Getting to Glacier Bay can be half of the challenge! Bartlett Cove and the nearby community of Gustavus are not located on a traditional road system. There is a single paved road that runs 9 miles between the airport in Gustavus and the public dock in Bartlett Cove. Alaska Marine Highway -- The only vehicle access outside of Gustavus is by ferry. The ferry runs twice weekly, typically on Monday and Wendsays, but check the ferry schedule as sailings are subject to change. Flying-- The only other option to access Gustavus. Various air taxi services fly into Gustavus from Juneau all year. Alaska Airlines flys ("The Jet") seasonally during the summer months. Air taxis will charge by the weight of gear ($/lbs) and Alaska Airlines charges by the bag. Air taxies may also be chartered for backcountry pickups & droppoffs or for direct flights into Bartlett Cove. Ground transportation and local taxi services are available in Gustavus to move you and your gear to Bartlett Cove. There are two stores in town that sell food and other provisions (e.g. bear spray, fuel, etc. ), but be aware that food and other items will carry a high cost and low or limited selection. Remember you are traveling to rural Alaska. If you have extra gear that you will not be using in the backcountry, the VIS has a locking gear cache where you can store items during your trip. During the summer season the Glacier Bay Lodge has shower and laundry facilities available for backcountry users. During summer months, the Glacier Bay Lodge day tour boat drops off and picks up backcountry campers and kayakers at designated locations in the upper bay. It is possible to get dropped off at one site and picked up at another. The dropoff locations often change from year to year and in response to wildlife and other resource concerns. Contact Glacier Bay Lodge or at 888-229-8686. The number of kaykas the day boat can carry is limited, please reseve your space early. There are a variety of park regulations that pertain to both campers and kayakers. You are responsible for knowing and abiding by these regulations. Kayaks are very difficult to see from cruise ships and other vessels—assume that vessels cannot see you. Watch out for wakes from cruise ships and other vessels. Freshwater availability depends on where you travel, but is usually easily found except on islands. All water should be boiled, filtered or treated for Giardia. Be aware of the threat of hypothermia and know about its prevention and treatment. 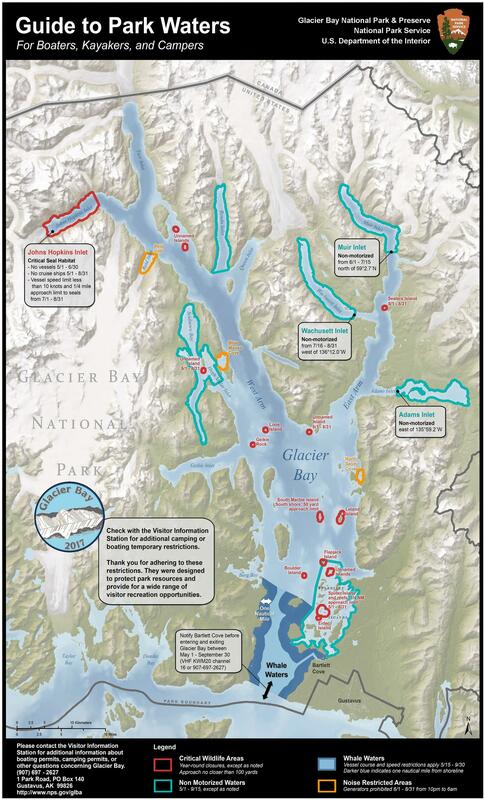 Kayakers should be aware of Glacier Bay’s cold water temperatures and understand tide charts and tidal currents. Never flag down another boat unless it is an emergency. Tides here are extreme...so be sure to store your kayak (and bear canisters) well above high tide. Stay at least ¼ mile away from the face of tidewater glaciers as calving can occur suddenly resulting in large waves. Be cautious near all icebergs, which often roll unexpectedly and could easily flip a kayak. In the event of an emergency in the backcountry it is important to have a reliable way to make contact with someone that can assist you. There is no cellular phone service in Glacier Bay. Many backcountry users now carry Personal Locator Beacons (PLB). Satellite Emergency Notification Device like inReach or SPOT are also popular. Satellite phones provide a quick way to communicate. Please note that the Visitor Information Station does not have the capability to communicate directly with you using devices like inReach or SPOT. While satellite based devices are nice, carrying a simple handheld marine VHF radio will substantially increase your ability to make contact with outside help. More than a million acres await the backcountry traveler, however there are no trails in the Glacier Bay backcountry. Dense alder thickets and steep rocky cliffs can make foot travel very challenging and often impossible. The terrain is rugged by any standard. Be prepared to hike over rough and rocky ground. Shoreline and gravel streambeds usually offer the best routes. Most backcountry users visit between May and August. If you choose to take a trip during the off season, be aware that most services are closed and unavailable. You'll need to be self sufficient and prepared to visit with little or no support. Both black and brown/grizzly bears are frequently seen throughout the park. These are wild animals and should always be considered to be potentially dangerous. When hiking, lessen your chance of a bear encounter by looking for bear signs, making noise, and traveling in groups. Consider carrying bear spray in the backcountry. It is important that bears never come in contact with human food, so NEVER leave food unattended. Keep a clean camp. Store food and any scented items in bear resistant food containers at least 100 yards from your campsite. Do all cooking and eating in the intertidal zone at least 100 yards from your campsite. If you do encounter a bear, remain calm, identify yourself as a human (talk to the bear) and stand your ground. Do not run. You can not out run a bear and fleeing may trigger the bear’s chase response. An ever present danger in cold climates is hypothermia, a condition created when you lose body heat faster than you create it. Early symptoms of hypothermia include slurred speech, trembling, exhaustion, stumbling, and impaired judgment. Unchecked, symptoms may progress to mental confusion, unconsciousness, and eventually death. Hypothermia can result from cold ambient temperatures between 30 and 60 degrees F, especially when accompanied by wind or rain. Should you get wet, you must be aware that hypothermia will likely follow. Put on rainwear or warm clothes before you become soaked or cold. Ventilate or remove clothing layers before you sweat. Wrap sleeping bags and clothing in plastic bags. Eat high calorie food throughout the day before you become exhausted. Keep hydrated. Make sure all members of your party are aware of the symptoms of hypothermia and look out for each other. The objective of hypothermia treatment is to rewarm as fast as possible. Begin by finding a spot out of the wind, removing wet clothing, and adding dry layers. "FEED AND HEAT." That is, first provide the body with quick calories that will enable it to produce heat (FEED). Simple foods such as candy bars and hot chocolate will be absorbed the fastest. Follow up with food containing more complex carbohydrates such as bread and fruit. "HEAT" means rewarm quickly by exercising and moving. Walk about or practice isometric exercises inside the tent or shelter. Body movement and exercise will usually affect rewarming considerably more than remaining still under piles of sleeping bags. Avoid alcohol as it increases heat loss. If a hypothermic patient has ceased shivering, has exhibited a dramatic decrease in mental status such as hallucinations and unconsciousness, and their core body temperature is below 90 degrees, the patient has severe hypothermia. Field rewarming of severely hypothermic patients can be dangerous, and is usually not effective. Transport the patient to the nearest medical facility. The use of bear-resistant canisters for storage of food, garbage and other scented items was initiated in Glacier Bay National Park in 1991 and is now required for the safety and convenience of campers and kayakers. Since that time, the frequency of incidents where bears have damaged property or obtained food has remarkably decreased. The use of bear-resistant canisters is required in all treeless areas of Glacier Bay (generally the upper half of the bay) and is highly recommended in all areas of the park. All food, garbage, and other scented items (including toiletries, bottled drinks, and canned food) must be placed inside bear resistant food canisters. The National Park Service loans, free of charge, bear-resistant canisters to hikers and kayakers who are staying in the backcountry of the park. They will be issued with your permit from the Visitor Information Station at the public dock in Bartlett Cove. The canisters are made of PVC (hard plastic), and are lightweight and sturdy. This canister is designed to slip into a camper's backpack. It measures 8" x 12" and weighs 2.8 pounds. With 560 cubic inches of volume it will hold approximately 6 person-days of food. Plastic liners will be issued with the canisters to help reduce food odors, and because the canisters are not watertight on their own. However, food odors cannot be completely eliminated. Canisters should therefore be stored at least 100 yards downwind of the campsite by wedging between rocks or alder branches well above the high tide line. Canisters should be stored away from obvious bear trails or travel routes. Give some thought to where a canister might roll if a bear does locate it. Canisters should not be used to stabilize cooking stoves, as the heat may melt or warp the canister lids. Canisters are not watertight and do not float. If you choose to bring your own canister please ensure it is approved by the The Interagency Grizzly Bear Committee (IGBC) and listed as a certified bear resistant product. We advise against using "screw top" canister because glacial silt and sand may work into the threads, effectively locking them stuck, and making it impossible for you to open your canister. How many bears utilize Glacier Bay?